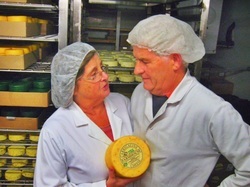 Ann and Pat O’Farrell have been producing cheese on their farm at Carrigaline in south-east Cork since 1987. Pat returned to resurrect the family farm in 1983, the same year as the reduction in milk quotas which acted as such a spur to farmhouse cheesemaking all over Ireland. Under that arrangement Pat would have earned about £5000 a year for 10,000 gallons of milk, not enough to support himself, Ann and their five children. Pat attended a course in cheesemaking in UCC in 1983-84, and as he says ‘things started from there.’ Pat finished the course with nine different cheese recipes, which was whittled down to three and this trio was then brought to the local Supervalu for a tasting. The public reacted far more favourably to one of the cheeses, and this ‘survivor’ went on to become the basis for Carrigaline cheese. Over the next year or so Ann and Pat tweaked the recipe continuously and by the end of 1986 had a cheese which they were happy to sell. 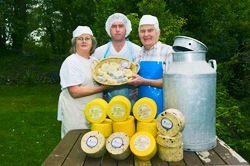 Carrigaline Natural cheese went to market the following year and they have never looked back. In 2000 Pat made the decision to get out of milk production. Time demands and a lack of profitability in milk production forced his hand. The O’Farrells now buy in their milk from their neighbour, to whom Pat transferred his quota in 2000. The milk still comes from pedigree Friesians grazing on limestone and the O’Farrells can focus on their true passion, cheese! ​Over the years Ann and Pat have developed the range of cheeses to include, Original, Beech Smoked, Dillisk Seawed, Garlic & Herb, Blueberry and Cranberry. Check out where our artisan cheeses are now stocked near you!